Companies who purchase XenMobile Enterprise are entitled to use Citrix ShareFile as well. The integration of ShareFile and XenMobile creates whole new challenges, which I won’t discuss in the article. I’m currently writing a separate blog about the XenMobile / ShareFile integration. Every shared folder within ShareFile may contain other authorizations, which makes it very flexible as collaboration platform. Granting users access to folders however can be a very time consuming process and painful process. The most obvious method would be through the ShareFile website (Control Plane), but in our case it took up to 3 minutes to add a single user or distribution group to a folder. This was mainly caused by the large amount of distribution groups we initially used. With the default management tools it’s a real nightmare when 800+ folders have to be modified, lucky we were able to create a more efficient method. Later on I will explain how we were able to automate and speed-up several ShareFile tasks. To simplify the folder authorisation process ShareFile offers “Distribution Groups” which are similar to active directory groups. When distribution groups are being added to shared folder users only have to be member of the corresponding groups to get access to shared folders. Creating and maintaining Distribution Groups via the ShareFile website (Control Plane) can be done for small environments but is very labor intensive for enterprise accounts when the enterprise environment needs a lot of distribution groups and has a lot of users! In an enterprise environment I want the “Distribution Groups” to be in sync with linked active directory groups. For this, and several other tasks Citrix Sharefile offers a User Management Tools (UMT) which can be used to automatically synchronize those groups. In our case we used a different method which I will discuss later on. Make use of UMT to synchronize ShareFile distribution groups with Active Directory groups! As just discussed the User Management Tool (UMT) can be used to simplify some ShareFile administration tasks. UMT can be used to provision new ShareFile user accounts, create distribution groups, link distribution groups to AD groups and accordingly update group membership of distribution groups. Unfortunately we experienced some issues with the User Management Tool 1.7 and initially weren’t able to make use of it. Despite the fact that all groups were visible in the logs files, several AD groups were not visible in the GUI, without this we weren’t able to create new rules for those. UMT Rules are used to create and maintain membership of distribution groups, according the linked AD groups. The UMT Rules which were in place, didn’t update the groups membership correctly in several cases. Finally we discovered why several AD Groups were not being displayed in the UMT GUI. UMT uses the group displayname when it’s available, in our case we had several active directory groups with a different displayname (Previously someone renamed them renamed incorrectly). Second thing we found out was that UMT can only manage distribution groups and sharefile users which were created by UMT itself. Using UMT to manage distribution groups without also creating and updating ShareFile users is a non-supported option for the tool. Don’t worry if you are currently running in à mixed mode were accounts are created by both thé App Controller and UMT. 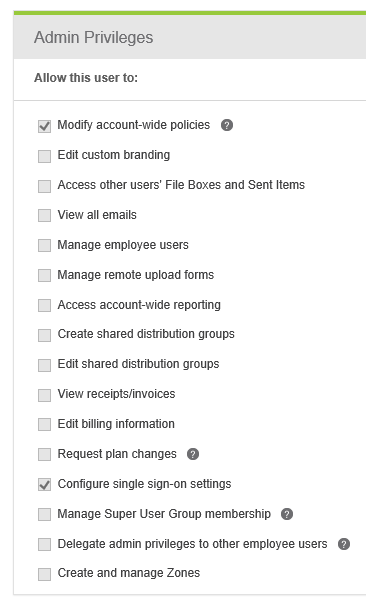 The missing UMT attribute in the ShareFile user account (within the Control Plane) can be updated afterwards by running a created new user account rule. Existing accounts won’t be overwritten or created twice, but the existing account will be updated and will be manageable from UMT afterwards. So here we have a dilemma, we are using the XenMobile AppController for ShareFile SSON and auto provisioning, but in fact we should be using the UMT tool. What will happen with ShareFile SSON within XenMobile if were are switching over to UMT? This raises some challenges, how where we going to manage this enterprise account? ShareFile Support informed us of a non official workaround which would disable the XenMobile Appcontroller auto provisioning. Within the AppController create a Roles, for example “APP-XAM-ShareFile” and add the AD Group containing all ShareFile users. 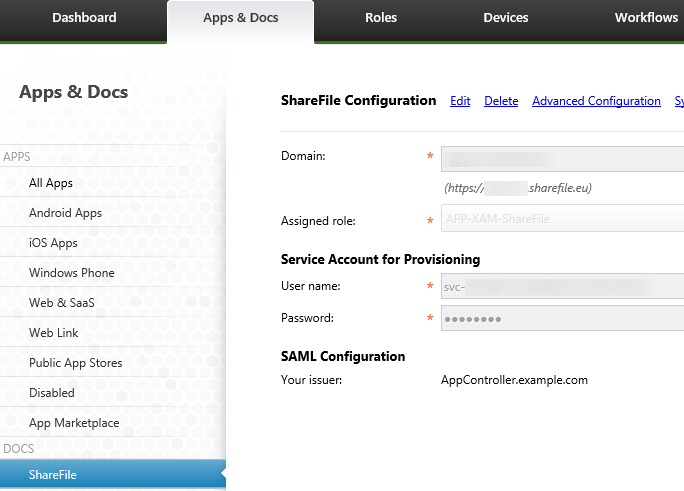 Within the AppController on the Apps & Docs tab configure ShareFile. 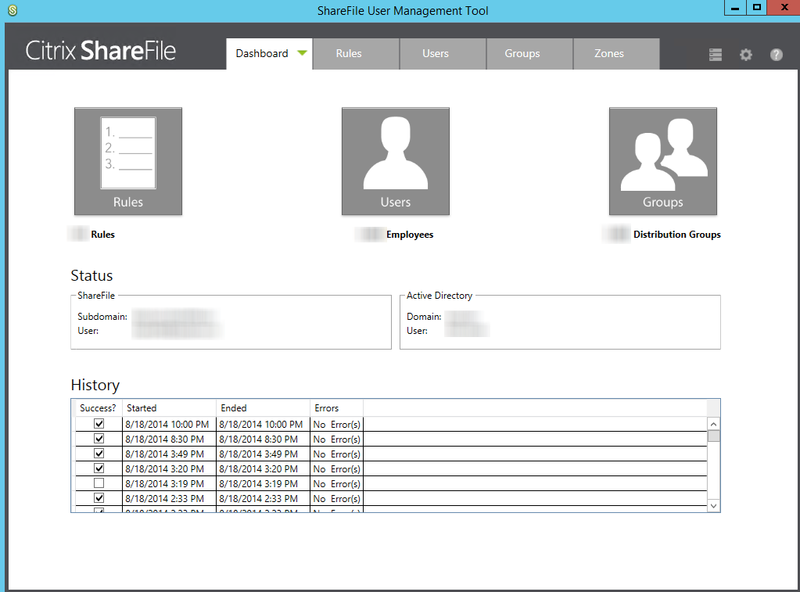 Assign the previously created ShareFile user and Role. Check the SSON url within the ShareFile control plane, update ShareFile settings in the AppController causes SSON url reset ! The way the App Controller is designed, AppC will still try to provision the users in ShareFile. Checking at the backend logs from the AppC database, it can be seen that the AppC is under the impression that it has successfully provisioned the users in SF and get a success status. However, because of the way the PseudoSuperUser permissions are configured, it actually fails at the ShareFile end based on user permissions. This achieves the purpose of stopping provisioning. Be aware updating the ShareFile configuration in the AppController will reset the Login URL on the control plane! If user are not able to logon through SAML and receives a error message “ShareFile SAML is no longer accessible to you” check the users group membership assigned in bullet 3. The ShareFile_SAM_SP mirror list is only update once a day at 02:00 and cannot be forced manually! At first we configured our ShareFile / XenMobile setup according to Citrix documentation Configure ShareFile Single Sign-On with XenMobile. In this case we are dependant of the 02:00 Control Plane synchronization which prevents new ShareFile users from using their account right away. However if you forget this and configure it exactly as we described in the section “Disable AppS Auto Provisioning” you are not affected by the 02:00 sync! In this case you are only making use of the ShareFile SAML mirror list within the App Controller, which can be synchronized manually. Provisioning a new ShareFile SAML user can be done in minutes ! Just to be sure check if user exists on ShareFile_SAML mirror list and user is good to go! Make it easy on yourself, don’t use the ShareFile_SAML_SP application for SSON in a XenMobile / ShareFile setup! Most likely something is wrong with the “Active Directory” of “ShareFile” mirror list within the App Controller. Logon to the admin console https:/AppCFQDN:4443/admin/ and check both mirror lists. Even do everything looks correct, sometime you need to reconcile the user from both mirror lists to get it working again. From a user perspective ShareFile did a great jobs to facilitate users with a easy way to migrate their data. In our situation the case was slightly different, the IT department was supposed to migrate all existing shared and personal data into ShareFile. After examining the various methods we decided the ShareFile Sync for PowerShell would be our best option. Unfortunately there is not that many information on this, Helge Klein wrote a nice blog about this. Only challenge with this is the RemoteFolderName which needs to be extracted, folder by folder, not something you would like to manually. Lucky we were able to automate this, which I will discuss later. Just like the ‘shared folders’ the ‘my files and folder’ (personal folder) also contains a RemoteFoldersName. You will need this RemoteFolderName to upload all personal userdata into ShareFile. The personal folder is being created soon as the users logs on the first time, not when the account is being provisioned. So therefore, you (the migration team), have to logon with all ShareFile user accounts just to get the personal folder created. To our knowledge there currently is no other option, so again we had to think of another trick. When we started the project we used a CIFS share hosted on a NetApp. After a while ShareFile suddenly stopped adding new files. Files were being upload to the temp folder, but not moved to the persistentstorage folder anymore, even tho we had plenty of storage available. It took us a while to figure out what was causing the issue. Fortunately ShareFile support came with the answer it probably had to do with the default MaxDirSize value of the NetApp. After uploading ShareFile moves all data into one single folder, in our case that folder contained 500.000 + files, which exceeded the maximum default number of files on a NetApp. After we increased this limit we were good to go again. The log files were misleading, and first we misinterpreted those. System.ApplicationException: Failure moving file ‘\NetAppShare$filesul-api-xxxx’ to cache location ‘\NetAppShare$persistentstoragesf-eu-1xxxx’! —> System.IO.IOException: There is not enough space on the disk. No changes to the file system are required since NTFS supports more than 4 billion files in one folder. In practice, according to ShareFile support, one customers had an issue on NTFS because of the 8.3 file names. There is an article that provides some recommendations for Windows file servers: http://blogs.technet.com/b/josebda/archive/2012/11/13/windows-server-2012-file-server-tip-disable-8-3-naming-and-strip-those-short-names-too.aspx . Unfortunately, ShareFile support do not have much real-life data on that and cannot verify if the change is required/useful. ShareFile support noticed a performance decrease on Windows Server 2008 with 1.5M files, although this caused no zone corruption. After we migrated several users from the public to the on premise storage zone, ShareFile was reporting “File operation in progress” for ever, even with completely empty accounts. ShareFile is FINRA compliant, but only in case cloud storage is being used, the cannot be used with on-premise storage. There currently is no way for Citrix to enable Archiving since they do not control the data that is stored in your private zone. Archiving is used for compliance on ShareFile Financial accounts and that option is not available on this Enterprise account. To backup all ShareFile data we daily backup the persistancestorage folder to an offsite location. This way we are able to meet the customer’s requirement to restore files 7 years back in time. Files deleted in ShareFile remain in the persistent storage 7 days, before really removed. 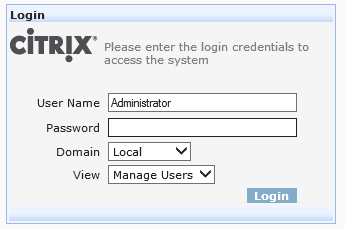 The file meta data, which exists in the ShareFile control plane is kept for 2 years by Citrix. This can be a challenge because without the metadata we don’t know which file we need. We asked ShareFile support if we are able to backup the metadata our self, or if ShareFile is able to keep the meta data for at least 7 years, but until now we are still awaiting the answer. More information regarding ShareFile backups can be found within the eDocs. Automatically logon with all ShareFile accounts, so the personal folder is being created. We are planning to release this freeware toolkit somewhere around our E2EVC 2014 Barcelona ShareFile presentation, presented by Martijn Hulsman and Esther Barthel. Despite the technical challenges we faced during this project I really like ShareFile, it certainly increase my ability to access my data from any device, from any place, in a secure way. By using our Enterprise Ready Toolkit upcoming ShareFile migrations will be going much smoother and we’ll be able to serve our customers much better. I do hope several needed features will be added to upcoming releases of the User Management Tool, so everyone can profit those. Finally I would like to thank all Citrix ShareFile Support members and Success Managers who have accompanied us to make this project a success! And do not forget Daniel Nikolic for the time he invested in the Enterprise Ready Toolkit !